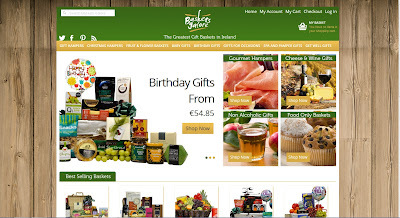 When BasketsGalore first began back in 2001 we launched one main website in 2002/03. All sales went through this one site, but as the company has grown we've introduced new websites for particular markets and also to comply with sales laws. Basketsgalore.ie is our gift basket site priced in Euro and has been growing in strength over the past number of years. We now have premises in Co. Louth and Co. Down and can deliver anywhere in Ireland on a next day basis. Just this week it has been re-launched with a new look and navigation and we hope you agree is better than ever! If you are an existing customer your account details will have been transferred over, so there is no need to re-register. We think the new design will make finding your perfect gift basket even easier and the newly improved shopping cart should save you more time. We love to hear from you, so please join the BasketsGalore community on Facebook, Twitter, Pinterest etc. We'll also keep you updated on our latest offers and competitions. If you notice any errors on the new site please just let us know & we'll get our in-house IT team to fix it straight away.